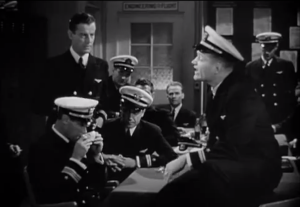 I originally watched Flight Command because it was one of Red Skelton‘s earliest movie roles — which is technically true; Red’s in the film as part of the Hellcats squadron, acting as the class clown, but he’s definitely a secondary character. Flight Command is primarily about a brash young pilot, Alan Drake (played by Robert Taylor) who’s recruited straight out of college to join the premier squad of Navy Hellcats. He has trouble fitting in at first, although the flight commander (played by a young and dashing Walter Pidgeon) tries to help — as does the commander’s wife (played by Ruth Hussey). There’s a suspected romantic triangle between Drake and the commander’s wife (which was only him trying to console her on the death of her brother) — but all turns out well in the end. Flight Command is well worth watching — Walter Pidgeon gives a wonderful performance as the stoic husband, who tries to reach out emotionally to his grieving wife; he’s willing to give up his Navy career for her sake, which by that time in the movie it’s clear to the audience what an enormous sacrifice that would be. The night fog is like a soup you can stand your spoon in. But Alan Drake, en route to join the elite Navy Hell Cats fighter squadron, disobeys orders to abandon his aircraft and hit the silk. The headstrong maneuver doesn’t sit well with the tightly knit squad. And the team’s opinion of Drake will plunge further when he’s suspected of romancing the unit commander’s wife. 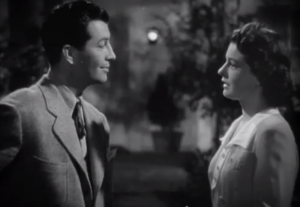 Robert Taylor plays the cocksure cadet who must prove himself in this pre-war film whose scenes of aerial training and readiness mirrored America’s growing awareness that it may soon be involved in World War II. Taylor prepared for the role by taking flight lessons and developed a lifelong love of aviation. He joined the Navy Air Corps during the war. Mugger (Red Skelton): I know a lieutenant who said “no” to an Admiral once. Pilot: What happened to him? Mugger (Red Skelton): Nothin’ — he’s still a lieutenant. He’s always gonna be a lieutenant! Pilot: It’s all then? Then what’re we talking about? Mugger: Well, we gotta talk about something! [being introducing to the other Hellcats] Pilot: This is Rhodes. Mugger (Red Skelton): Wait a minute, I’m confused — I thought we were doing the ribbing? Mugger (Red Skelton): We’ll get him on the range, and see if he shoots a gun as well as his mouth.